GoldMine is a powerful yet easy-to-use Customer Relationship Management solution, specifically designed for organizing and tracking sales, storing and managing contact information, reporting, follow-up and integration with other software products. 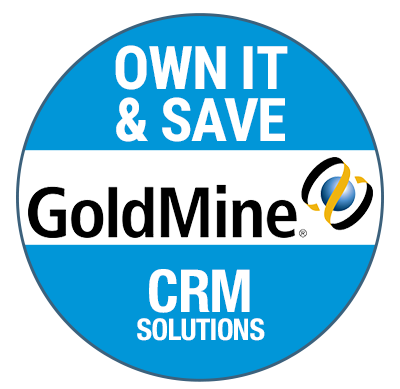 With an OWN-IT (one-time purchase) pricing structure, GoldMine provides the best CRM value over time. Adding GoldMine to one of your servers will save you up to 70% in year two and beyond. With GoldMine, you can easily access the key modules, such as Activities, Contacts, Opportunities and Cases. With one click you can edit a contact, schedule an event for your calendar and activity list, schedule a forecasted sale to add to your pipeline, and complete an unscheduled item such as an incoming call. Your users will see real-time information including custom fields that can be easily set up by your administrator. GoldMine also validates any field with the validation lookup files you set up for proper reporting and less typing. As a GoldMine Premier Partner, we have deployed GoldMine to 100's of organizations. We are business analysts and developers, and we want to make GoldMine fit your organization like a glove. Put us to the test, we love a challenge. We publish a wealth of tips, customization examples, and reviews of useful tools that work with GoldMine. To learn more visit our blog. This collection of GoldMine training videos features a review of the advanced (System Administration features).